Item297 - Perth 18F. Copy of Plan of Perth Townsite Map 18E (see Map 18E for details) added notation of Fieldbook 2 p. 9 by W. Phelps, 1859-60 [scale: 6 chains to inch, Tally No. 005728]. Item298 - Perth 18H (South Perth). Plan of South Perth showing Lots & Streets from Melville Terrace to Coode Street & South Terrace to Mill Point Road by W. Phelps, 1858 (Later additions & alterations) [scale: 4 chains to an inch, Tally No. 005759]. Item299 - Perth 18I. Plan of Sub. Allotments in Perth Townsite vicinity Melville Water, Fremantle & Quarry Roads & Winthrop Avenue. Lots by William Phelps 1858-1860; by James Cowle 1867; by A. Forrest 1901; by G.W. Leeming [scale: 4 chains to an inch, Tally No. 005760]. Item300 - Perth 18J. Plan of Perth Burial Ground as marked out in 1845 bounded by Waterloo Crescent, Wickham & Horatio Streets (unsigned) [scale: 20 feet to an inch, Tally No. 005761]. Item301 - Perth 18L. Plan of New Allotments in Perth Townsite bounded by Newcastle Street, Old Road to Guildford, Walcott & Palmerston Streets, Lakes Henderson, Three Island & Mongers & surrounding Lots. By William Phelps 1858 and 1860 [scale: 6 chains to an inch, Tally No. 005762]. Item 297 - Perth 18F. 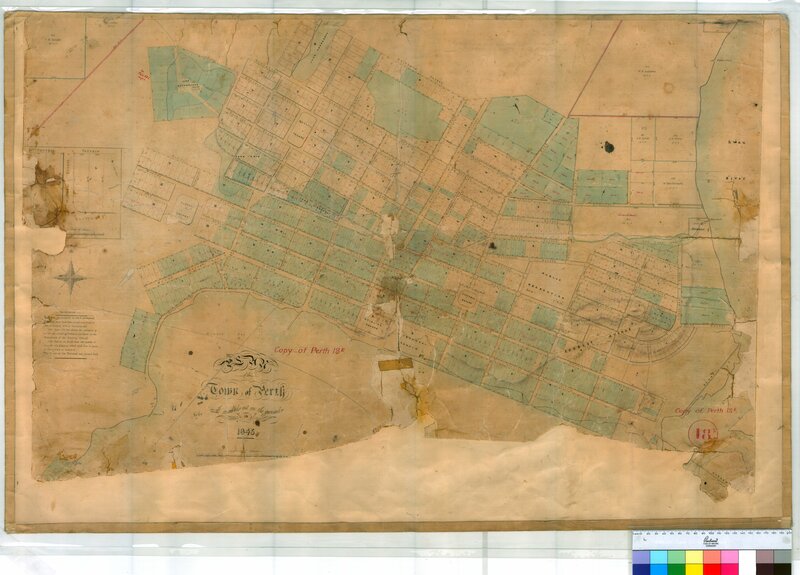 Copy of Plan of Perth Townsite Map 18E (see Map 18E for details) added notation of Fieldbook 2 p. 9 by W. Phelps, 1859-60 [scale: 6 chains to inch, Tally No. 005728]. Perth 18F. Copy of Plan of Perth Townsite Map 18E (see Map 18E for details) added notation of Fieldbook 2 p. 9 by W. Phelps, 1859-60 [scale: 6 chains to inch, Tally No. 005728]. Confirm Item Request: Perth 18F. Copy of Plan of Perth Townsite Map 18E (see Map 18E for details) added notation of Fieldbook 2 p. 9 by W. Phelps, 1859-60 [scale: 6 chains to inch, Tally No. 005728].